It's no secret that breakfast is important for weight loss. On top of providing nutrients you need to stay energized and active all day, it helps control hunger in the morning, so you're less likely to turn to vending machine fare when hunger strikes. But many breakfast staples -- toast, oatmeal, bagels -- are all packed with carbs, which makes them less-than-ideal when you're trying to curb your carb intake. Instead, opt for one of these delicious high-protein and low-carb options for your first meal of the day. Eggs are virtually carb-free and packed with protein -- 6 grams per large egg, to be exact. So they're the perfect breakfast staple to keep your carb intake low. And while old favorites like scrambled and fried eggs can work in a low-carb diet, don't be afraid to get creative. Enter egg fritters. Made by mixing eggs, egg whites, veggies and cheese, these egg "pancakes" help you pack tons of protein into your breakfast, and get fiber, vitamins and minerals from the veggies, too. To make them, simply pulse your favorite veggies in a food processor until chopped fine -- to pieces about the size of grains of rice -- then mix in the eggs, egg whites, shredded cheese and salt and pepper to taste. Spoon the mixture onto a griddle and cook like you would a pancake. Although you can use any veggie, these are especially delicious using broccoli. Salads aren't exactly standard breakfast fare -- but that doesn't mean they can't be. 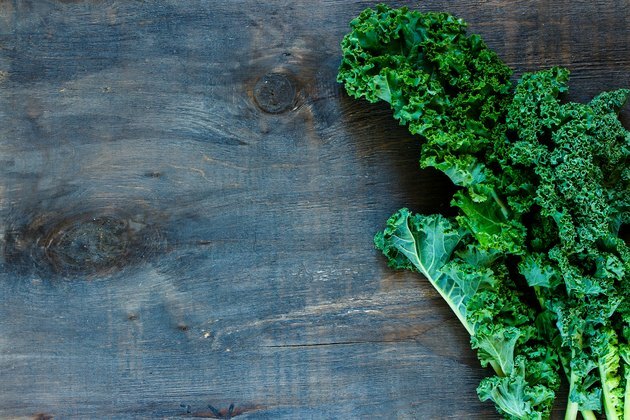 Leafy greens are virtually carb-free -- a cup of raw kale, for example, has less than a gram of digestible carbohydrates -- so you can bulk up your meal with two or three cups of greens without blowing your carb budget. Top your salad with a lean protein, like turkey breast, that has 26 grams of protein per 3-ounce portion. Or opt for scrambled eggs, lean grilled chicken, or even chopped turkey sausage as other high-protein options. Ditch the typical salad dressing and instead use salsa -- it has 3 net carbs in 1/4 cup. Combined with the egg and meat, this makes a delicious huevos rancheros-inspired salad that fits into even strict low-carb diets. Regular pancakes are delicious, but full of carbs -- thanks to the flour used to make them and the sugar in the pancake syrup. Use lower-carb ingredients to make pancakes that are just as yummy. Simply mix a scoop of flavored protein powder with an egg, a spoonful of ground flaxseed -- which is virtually carb-free -- a splash of vanilla extract and a sprinkle of cinnamon and stevia. Mix the "batter" until it reaches the desired consistency. You can add unsweetened almond milk, a spoonful at a time, to thin it out if you'd like, then cook on the griddle over low heat. Depending on the protein powder you choose, your pancakes could have 20 to 30 grams of protein per serving, or even more. Keep the toppings simple and low in carbs -- try a dusting of powdered stevia, or top your pancakes with a dollop of plain, unsweetened Greek yogurt -- each ounce has just 1 gram of carbohydrate but contains almost 3 grams of protein. Though fluffy protein pancakes or a heaping breakfast salad might work when you have a few minutes to spare, sometimes you need to get out the door ASAP. Keep homemade nut butters on hand for days when you have literally no time to make breakfast. Nuts supply fiber, protein and vitamins like magnesium, which makes them a healthy addition to your diet. And they're also low-carb -- a tablespoon of almond butter, for example, has 2 grams of carbohydrates but supplies 4 grams of protein. Make your own nut butter by adding roasted, unsalted and unflavored nuts to a food processor. Pulse until roughly chopped -- and remove a few tablespoons of nuts at this stage to add back later for "chunky" butter -- then blend continuously until the nuts reach the right consistency, 10 to 15 minutes. Flavor your nut butter with low-carb ingredients like vanilla bean powder, cinnamon or cocoa powder. Keep the jar in the fridge, and portion out a few 2-tablespoon servings in smaller containers for instant breakfast on-the-go. Sure, eating nut butter might not feel too fancy, but it is delicious -- and lets you stick to your diet even if you're seriously in a time crunch.